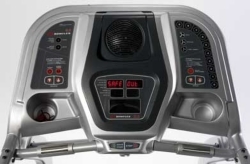 The Bowflex 5-Series treadmill is an improved version of the popular 3-Series. 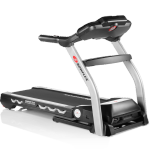 A more powerful motor, longer treadbelt and twice the number of workout programs is nice to have, but these improvements come at a price; the Bowflex 5-Series has a suggested retail price of $2200, although you can often find this treadmill on sale for around $1300. UPDATE: The Bowflex 5-Series is no longer available. Check out the latest Bowflex treadmill reviews here. The Bowflex 5-Series’ 2.5 hp treadmill motor and 60" running surface make this model suitable for serious runners. The maximum speed of 10 mph is on par with other treadmill brands in this price range. We couldn't find any endorsements from fitness pros for this particular Bowflex model but people who bought the 5-Series treadmill liked the streamlined design, the workout variety and SoftDrop™ folding mechanism. 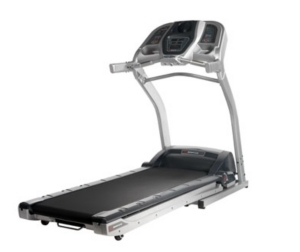 The major drawback with this model, as with all Bowflex treadmills, is the noise problem due in large part to the plastic parts used in its construction. Some of these parts seem to wear out just after the parts warranty expires. People who exercise regularly on the Bowflex 5-Series treadmill consider the noise level a nuisance - but something they can live with. Since Bowflex is well known as a manufacturer of quality strength training equipment, the company probably does not want to compromise quality with their treadmill line. The plastic parts are a poor choice, but otherwise the Bowflex 5-Series is a decent product. 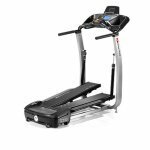 Compare the Bowflex 5-Series with the 7-Series treadmill before you invest your money in this one; it's only a few hundred dollars more. We suggest you compare this model with the Sole F83 which costs about the same but comes with an even better warranty and a 3 hp motor. On the other hand, the Bowflex 5-Series treadmill's running surface is one of the most spacious around. If the Bowflex name appeals to you and you can live with a bit of rattling, go for it.